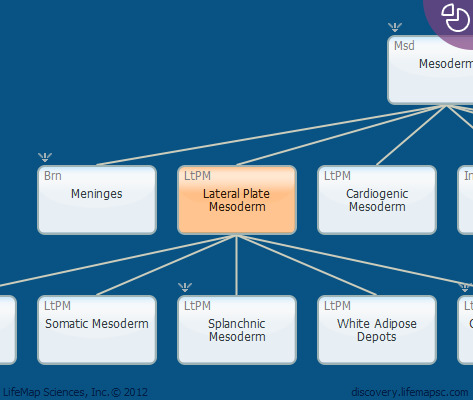 The lateral plate mesoderm (LPM) is one of the early mesoderm derivatives. It is located distal to the notochord and paraxial mesoderm and splits horizontally into the dorsal somatic mesoderm, which underlies the ectoderm, and the ventral splanchnic (visceral) mesoderm, which overlies the endoderm. The LPM gives rise to heart, blood vessels, blood cells and the lining of the body cavities. Developes on day 17 in human embryo.